Bet-Shmuel has entered the studio and once again successfully incorporates his devotion for the rich Assyrian culture. The album includes ancient Middle Eastern instruments such as the Jouza, Nay, and ‘ud. Boonie Ba-Boona offers the listener a pulsating mixture of orchestral sounds that cover eastern and western instruments. Accompanied by a variety of musicians, Bet-Shmuel offers melodies of hope and love, while enchanting the listener with a mixture of poetry and Assyrian folk. The enhanced portion of this CD production provides an interactive way for the listener to become apart of the recording process that went into Boonie Ba-Boona. Available online at Assyrian Market, CD Baby, and Amazon. 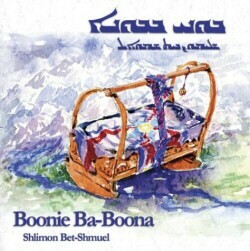 “Boonie Ba-Boona” by Shlimon Bet-Shmuel - Amazon's online bookstore.